Fromagination assisted with a world record on Wednesday, August 1! The world’s largest cheese board was assembled in downtown Madison…and we helped! 4,437 pounds of cheese came to the Capitol Square – engineered by Dairy Farmers of Wisconsin (formerly the Wisconsin Milk Marketing Board) to break the Guinness Book of World Records’ mark, previously set in the Netherlands. Assembled on a huge cheese “board” on King Street, directly east of the Capitol Square, the gigantic display was seven feet wide and 35 feet long! 2000 guests received a curated cheese plate with Wisconsin cheeses chosen by Fromagination. Others were invited to bid on wheels of cheese for a raffle that benefited the Great American Milk Drive. 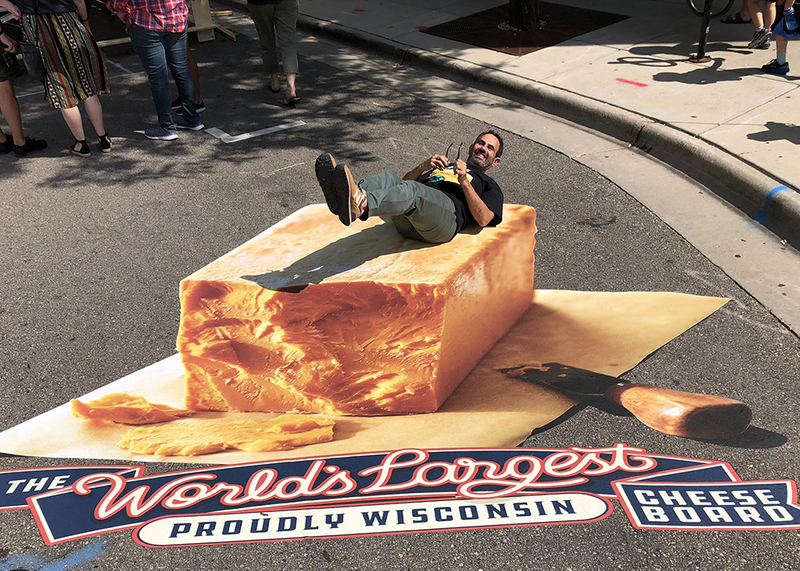 Fromagination’s owner and general manager, Ken Monteleone (picture above on an optical illusional chunk of cheese), helped coordinate the cheese cutting, which took place next to the Fromagination shop at Madison’s Park Hotel. He was there at 6:00 a.m. to make sure that the Guinness representative saw all the cheese officially weighed before it was delivered to the street display. The leftover cheese was donated to Second Harvest Foodbank of Southern Wisconsin, which provides food to people in need.